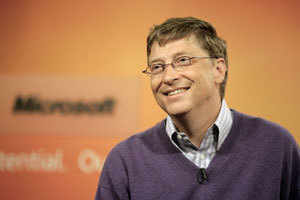 LONDON: Wife of Microsoft founder Bill Gates, Melinda, has said her children are banned from owning Apple products. Melind Gates, a philanthropist and world health campaigner, said that their two daughters and son had asked for an iPod, but 'they get Windows technology'. According to the Telegraph, she said that the wealth from our family came from Microsoft so there is no point in buying a competitor's products. In 2009, before Microsoft had introduced Windows Phone in response to the success of the iPhone, Mrs Gates, 48, admitted that she had been tempted by Apple products herself. According to the paper, despite the ban, pictures were published last year that appeared to show the couple oldest daughter Jennifer, 16, clutching an iPhone while jogging in Sydney.